The end of summer is a time most people don’t look forward to, as it signals the end of warm, sunny days, and the transition to cool weather. However, there is one thing to look forward to with the change of season – the Fall Fair. 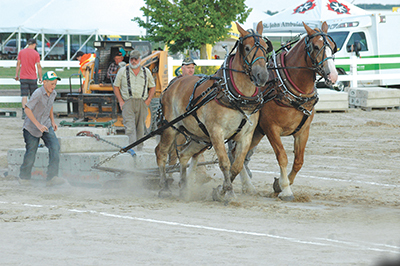 With a history dating from a decade before Orangeville’s incorporation as a village in 1864, the Orangeville Fair, has entertained countless numbers of Canadians near and far for 164 years. Beginning tomorrow (Friday, August 31st), and going through Sept. 1 and 2, and with the weather hopefully co-operating, the fair will look to continue providing something for everyone, both regulars and newcomers. Popular events include the tractor pull and demolition derby, along with numerous educational activities designed to teach people about the importance of agriculture to everyday life, along with live entertainment, livestock shows, tractor garden race, and many more exhibits. The site on Mono’s 5 Sideroad, just north of town, is host to multiple events annually, chief among them the fair. As the town has grown, expanded, and evolved, so has the fair, back from its days at the old fairgrounds where Walmart and Canadian Tire now stand. “We have a beer tent open all weekend, old school band live music all weekend. We have a classic car show on Saturday. We have a petting zoo, a pony ride,” were just some of the events Ms. Arseneau described. One new event this year is the Far Shot Axe Throwing & Archery Foam Target Display. She explained that the fair is hugely important for the society, as it shows the community not only what they do, but it is also a great way to show off the everyday life in the agricultural industry. “This new generation coming up needs to learn how to feed themselves,” she said. Ms. Arseneau concluded with, “See you at the fair,” and hopes to see many people show up and enjoy the fair. For more information regarding tickets, contact the Orangeville Agricultural Society office at 519-942-9597. To see the full schedule, and for more information on the society, visit www.oaseventscentre.ca/fair-schedule.